Nail art brushes are very important tool for nail art lovers and artists. Without these wonder tools, doing those swift motions is pretty impossible. Dipping them in one color and another and another to get that perfect looking ombre flower petal or doing gentle strokes for creating a leaf pattern. But once your nail art is done, cleaning these babies is a difficult task. Some of you may even just leave it with all the paint, polish and chemicals. Yeah, we all have done that once in a while! 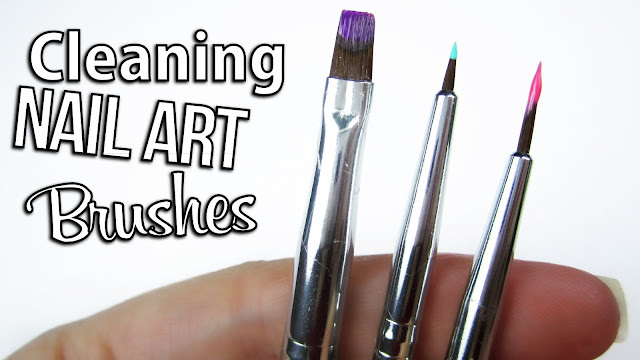 Cleaning nail art brushes is not only important task but imperative too! The bristles of the brush are very strong yet delicate. If the polish or paint dries up, it can affect the bristles and in some cases, breaks them too. Some of the nail art brushes are very expensive and breaking them like this is not a good thing. Hurtful for a nail art lover! Here is a tutorial that will help you in understanding the cleaning process better. So get started! Keep your brushes clean and nice to have the perfect smooth nail art application!